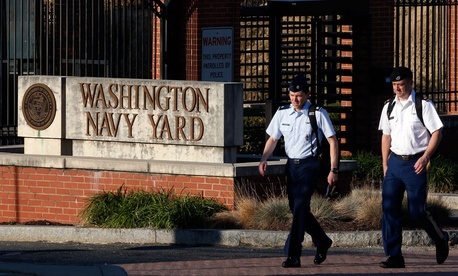 Six months after a government contractor shot and killed 12 employees at the Washington Navy Yard, a House panel found that hundreds of police departments across the country have been neglecting federal requirements that they provide criminal histories to security clearance investigators. A pair of reports on the security clearance process released Tuesday by the chairman and ranking member of the House Oversight and Government Reform Committee explored a range of issues related to the September 2013 shooting, including background checks, alleged contractor fraud and information-gathering on Aaron Alexis, the shooter. The release of the reports coincided with a Tuesday hearing on the topic that included witnesses from Office of Personnel Management, the Defense Department and officials from the three top contractors involved in security clearance background checks. The report by the Republican staff of the House Oversight and Government Reform Committee criticized 450 police departments -- including that of Seattle and the District of Columbia, where Navy Yard shooter Aaron Alexis had lived. It also faulted current practices that allow secret-level security clearances to last for 10 years without interim monitoring, and criticized the reluctance of current investigators to check websites and social media for tell-tale clues about applicants, a policy based on fear of relying on inaccurate information. A competing report by Ranking Member Rep. Elijah Cummings, D-Md., zeroed in on multiple issues involving U.S. Investigations Services, the company with the largest share of the federal background check contracting work. The Justice Department has charged USIS for the “dumping” of incomplete background checks submitted to the government hastily in order to be paid, according to the civil complaint. USIS, Cummings charged, might have denied Alexis his security clearance had it done more to obtain his earlier arrest record omitted by the city of Seattle. The company was also given a second contract by OPM to “review its own work,” Cummings said. And after a new parent company purchased USIS, the contractor “adopted aggressive new financial incentives to accelerate its work,” the report said. Sterling Phillips, the chief executive officer of USIS for the past year, stressed that all the executives involved in the bonuses and alleged fraud have departed, and cautioned that “we haven’t yet had our day in court.” USIS, he said, “moved aggressively” since learning of the questionable submissions in January 2012. “Today, USIS is a strong responsible contractor providing cost-effective work for OPM,” he said. OPM Director Katherine Archuleta said that the bonuses ended in 2010 and were given to the company, not to individuals, under the contract’s performance standards. “There are no current bonuses being given,” she said, noting that she took steps just last week to bring all final decisions on granting security clearances in-house. Justice, she added, is attempting to recover the bonus money in its civil suit. The quality standards for contractor checks on applicants are the same as those performed by federal employees, Archuleta said. Asked why so many local police departments were not cooperating with federal background checks, Archuleta said, “Some choose not to provide the information, others are small jurisdictions that may not have all the records.” The issue of local compliance is part of President Obama’s continuing 120-day review of the process, she added. OPM Inspector General Patrick McFarland said the failure of Seattle police and USIS to uncover Alexis’s prior arrest is “a classic example of a case in which people saw something but didn’t say something. It will take a big operation to change this,” he added. Issa said that his panel is preparing legislation, now that the hearing is over, that would provide new tools for agencies and contractors to compel localities to cooperate in providing better information. “We’ll be looking at you on an ongoing basis,” Issa told the three contractor representatives at the hearing. Committee Democrats Steve Lynch, D-Mass., and Cummings have already introduced such a bill, H.R. 4022.